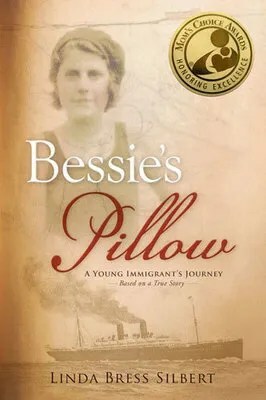 We recently had the opportunity to review Bessie’s Pillow, a new book by Linda Bress Silbert, published by Strong Learning, Inc. I read the book to myself first, after a couple of people in an online forum mentioned some possible concerns with it, but decided that it would be fine to read aloud to my children. I’m glad I did! We really enjoyed this true story. One thing that made it even more meaningful to us is that we have a family living with us at the moment, and the wife came from Latvia; she was born in Lithuania, where Bessie came from! I was glad to be able to ask her how to pronounce a Russian word. We greatly enjoyed Bessie’s Pillow. Esther commented that it has a unique perspective on immigration. Most of the stories that are written about European immigrants to America tell about people who traveled in steerage and lived in the tenements. Bessie was more upper-class, however, so the perspective is quite different. Another thing that was different about this book, from most, is that it is written in first-person, present-tense style. I’m not sure I’ve ever read a book quite that way, but it worked well. You are really drawn into Bessie’s life.